Rappe (2013). Figure 1. Direct sequencing and cultivation efforts are both integral aspects of molecular ecology. The molecular side of ecology has grown by leaps and bounds in recent decades. The review we covered not too long ago, did a nice job of summarizing many key aspects highlighting the importance of this relatively new molecular view of the world. In particular, fancy high throughput sequencing has allowed us to explore the difficult to visualize world of microbes – we can identify things that are there without actually growing cultures in the laboratory. It wasn’t until the mid 80’s that microbial diversity was examined using molecular tools, and eventually standard methods were developed for identification of bacterial isolates (namely, often sequencing the 16S rRNA gene). 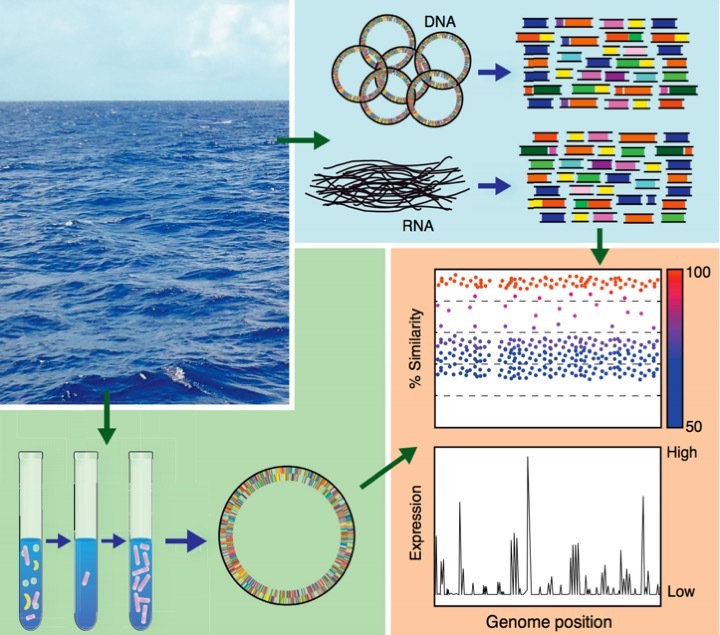 Metagenomics has been a game changer: from allowing us to explore the bacteria in a drop of seawater to identifying the key players affecting human health. In fact, once we were able to sequence environmental samples, we realized that only a small fraction of what is out there has been grown in a laboratory. Often the microbes that aren’t cultured are referred to as the “uncultivated microbial majority”. 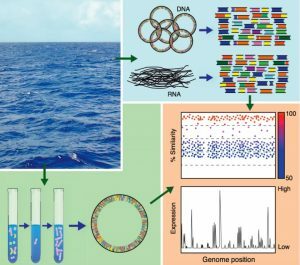 Marine microbial ecology has benefitted greatly from all of the metagenomics, transcriptomics and (generally) genomics-based studies. Many of the most abundant microbes that play major roles in biogeochemical cycling worldwide are difficult to obtain in culture. It wasn’t until relatively recently that specific high throughput culturing approaches were applied to isolate some of the most abundant lineages inhabiting the oceans. However, this challenge is not unique to environmental microbiology and also must be considered when studying systems such as the human gut. Lagier et al., (2016). Figure 1. 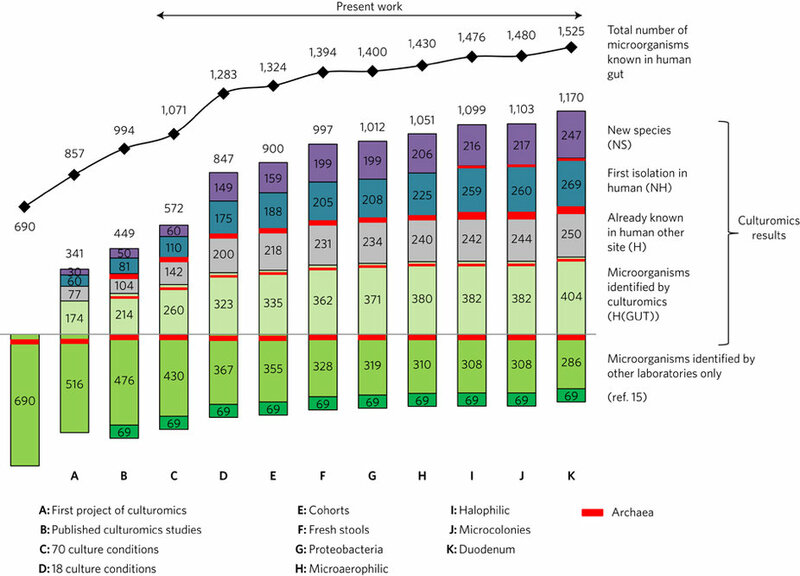 Number of microbes isolated from culturomics-based approaches. Understanding how distinct microbes affect human health has become a field in itself, and a great deal of what we know now has relied on sequencing. However, it’s important to keep in mind the value of actually culturing isolates as well, which allows for experiments linking the actual things isolates can do to the genes responsible (linking phenotype to genotype). In a recent paper in Nature Microbiology, Lagier and colleagues highlight the importance of continuing culturing efforts in addition to utilizing sequence based approaches. The authors summarize their overall culturomics scheme, which integrates the use of matrix-assisted laser desorption/ionization-time of flight (MALDI-TOF) and sequencing to identify growing colonies. They define this “-omics” term as the “rebirth of culture”, in which a high-throughput method is implemented involving the use of a ton of different culture conditions. Lagier et al., (2016). Figure 2. Summary of culturomics scheme. In addition to summarizing previous culturomic based studies, the authors also tested almost a million colonies from human gut samples. Ultimately, they isolated 1,057 species, of which 531 were never before identified in the gut and 197 were totally new. Furthermore, they deposited these new species in two culture collections and obtained genome sequences for 168 of them. 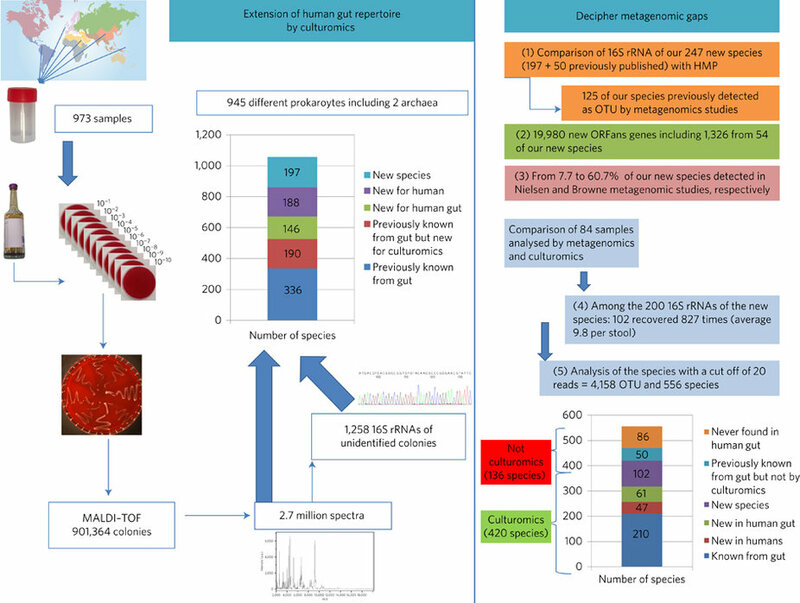 This represents a massive effort to isolate novel species from the human gut. I think it’s an interesting demonstration that it is indeed possible to isolate microbes previously thought to be “unculturable” while also highlighting how difficult that cultivation can be. Lagier et al., (2016). Figure 3. 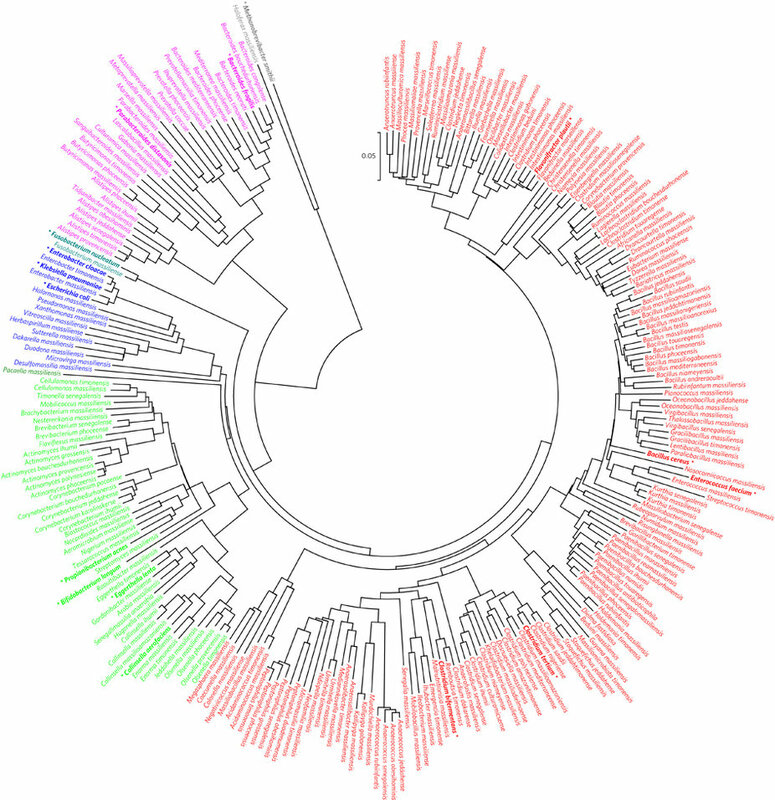 Phylogenetic tree of new species isolated using culturomics. On a side note, all this culturomics business, made me think about the other omics words generally thrown into the mix, there’s even a collection of them by Jonathan Eisen (he has pointed out the good, the bad and the ugly that this type of vocab term has introduced, I find it entertaining), which you can read here. It is essential that we continue to isolate microbes from a range of environments and ecological niches. It is clear that these microscopic players have essential roles globally ranging from driving biogeochemical cycles on land and in the ocean to influencing human health. The authors also discuss how cultivation efforts and metagenomics data are both ultimately required to obtain a bigger, broader picture of microbial diversity, and specifically, the human-associated microbes we are all intimately connected to. Lagier, J.C., Khelaifia, S., Alou, M.T., Ndongo, S., Dione, N., Hugon, P., Caputo, A., Cadoret, F., Traore, S.I., Dubourg, G. and Durand, G., 2016. Culture of previously uncultured members of the human gut microbiota by culturomics. Nature Microbiology, 1, p.16203. Whitman, W.B., Coleman, D.C. and Wiebe, W.J., 1998. Prokaryotes: the unseen majority. Proceedings of the National Academy of Sciences, 95(12), pp.6578-6583. Rappé, M.S. and Giovannoni, S.J., 2003. The uncultured microbial majority. Annual Reviews in Microbiology, 57(1), pp.369-394. Rappé, M.S., 2013. Stabilizing the foundation of the house that ‘omics builds: the evolving value of cultured isolates to marine microbiology. Current opinion in microbiology, 16(5), pp.618-624. This entry was posted in community ecology, genomics, medicine, metagenomics, microbiology and tagged human gut, microbiome, uncultivated majority. Bookmark the permalink.